First of all, the enormous price difference between raw wool off the sheep and a ball of wool in the shop is caused by all the work that goes into the ball of wool. 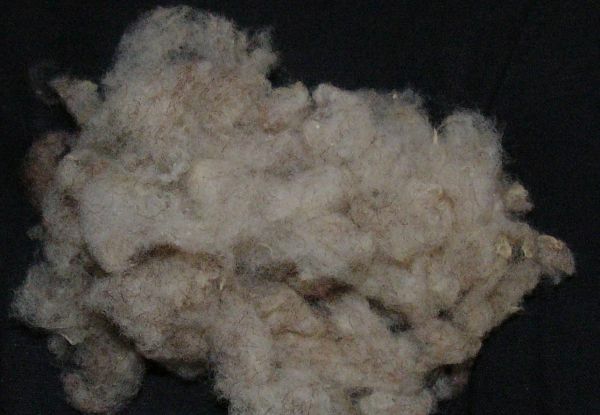 On the sheep wool is rather a nuisance, which is why there are several attempts to breed sheep that have good meat but shed their hair naturally, thus avoiding shearing. Only now can the wool be spun without problems. You can take shortcuts - for example, when the weather is warm you can spin clean, freshly shorn and not too greasy wool directly off the sheep, without further preparation. But in my experience, every well-executed step in the preparation process saves time for the next step. Meaning, well-sorted wool is quicker to wash, well-teased wool is easier to card, and so on. Dyeing (optional) can take place before washing (for irregular colour effects), after washing, after carding/combing, after spinning or even after knitting - depending on your schedule and desire and the effect you are aiming for. Those two actions would result in felting. This washing method can take days, but actual work are some ten minutes per bucket. This is a good method for large amounts of wool in summer, when you wash for your stash. In winter or when the wool is very greasy more work is needed. You'll only get rid of the grease with hot water and detergent (wool detergent, dish washing liquid or hair shampoo without conditioner). And now you need to be careful to avoid felting. That means, NO rubbing, only very careful stirring, always use water at the same temperature. At the end, rinse out well and maybe add a bit of vinegar to the rinse water (wool stands acids quite well but can be damaged by bases). But in my opinion that is all you need to observe. Of course, you can turn washing wool into a science, add soda to the washing water and use home-made soap - but why? If the wool is not squeaky clean after washing, it doesn't matter: For dyeing the wool will be simmered for half an hour, after spinning the yarn will be washed (or at least rinsed), after weaving or knitting the garment will be washed again - and after wearing it for the first time it won't be clean any more anyway. I can't say anything on combing because I still haven't made my wool combs. You will find anything you want to know in the book: Hand Woolcombing and Spinning by Peter Teal. For carding you can either use hand cards or a drum carder. Hand cards are not too costly, easily portable and there are many different versions (shape and distance between the teeth). Their main disadvantage is that you can only card a small amount of wool at once(1 to 2 g). Advantages are that the wool need not necessarily be teased before carding. And you can make so-called "rolags", little rolls of wool that make long-draw spinning easier and permit a true "woolen" yarn as per Mable Ross's instructions. Compared to what I read about it, I have simplified carding a bit: I take one card in my left hand (teeth face up) and stroke with wool over the cards until the teeth are covered with a thin layer of wool. Then I take the second card in my right hand (teeth face down) and brush it over the card in my left hand. The brushing starts at the right edge and progresses towards the left - as if I wanted to brush out long hair from bottom to top. During brushing wool fibres are transferred from the left-hand card to the right-hand card. The cards' teeth do NOT mesh during brushing! At some point you can't transfer any more hairs from left to right with this superficial brushing action. Then you dig the right card's teeth into those of the left card, tilt the right card and lift it off - but without pulling one card's teeth through the other's! This tilting and lifting action will transfer the rest of the fibres from the left-hand card to the right-hand card. And now for the unorthodox part: I simply turn both cards around - the right-hand (full) card faces up, the left-hand card is teeth down. And now I brush with the left hand over the right. So both hands do equal work. After 3 to 5 card changes the wool should be ready to spin and you can take it off. Either by lifting off the entire batt. Then you can roll it up in such a way that the fibres remain parallel to each other which will result in a smoother (semi-worsted) yarn. Or you can roll up the fibres from the end (which results in a rolag) - either with your hands or by brushing the empty card over the full one but this time so that the handles point in the same direction. Drum carders are expensive and you can't get them cheaply on E-Bay either. The fibres must be even better prepared than for hand carding, which is why a drum carder does not save as much time as one might think. 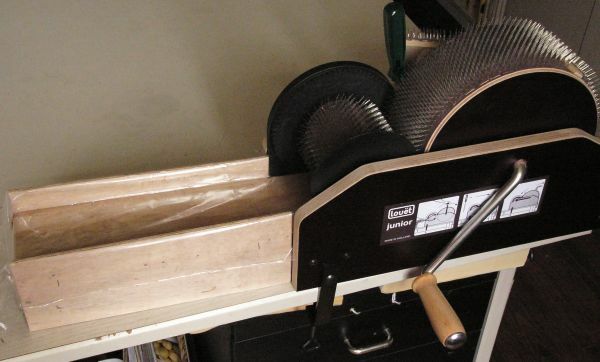 My drum carder is the Louët Junior (sold as Louët Roving in the U.S.) which is one of the lowest-cost carders on the market. It is small, light-weight, of simple, sturdy construction and maintenance-free. Carding with it is very simple and you'll get wool batts of approx. 14 to 30 g (0.5 to 1 oz) with fibres aligned parellel to each other. Light-weight carders should be clamped to the table for carding (the Louët Junior needs a table corner). Then you either lay the carefully teased fibres onto the feed tray, or, if there isn't one as for the Louët Junior (as I like having a feed tray I made one for my drum carder, which is what you see in the picture) hold the fibres close to the licker-in drum (the small one) and turn the large drum by means of the crank. 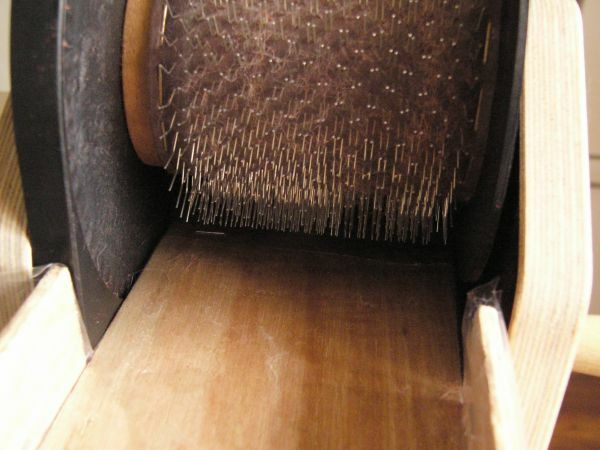 The licker-in drum will turn as well (but slower), take up the fibres and pass it on to the large drum where the fibres will be arranged more or less length-wise. Steady cranking and adding fibres will fill the large drum (and in the case of the Louët Junior with many types of fibres the small drum will fill as well - for other drum carders that is a sign that something is wrong). When the big drum is full you pass a long, pointy object (a doffer stick or a knitting needle) through the gap in the teeth where the ends of the carding cloth meet on the drum and lift off the fibres until they separate. Now you can carefully pull off the batt. Carding once will not be enough in most cases. So you will have to divide the batt, thin it out by pulling, and card it again. And maybe once (or twice, or...) more... In my experience three passes through the carder are enough for fibres of one kind and colour, but for blending more passes will likely be necessary. Every time when you want to card a different fibre you need to carefully clean both drums of the carder. This may take as much time as carding itself. Therefore I'd recommend to drumcard in one go all the washed wool you have of one kind. Is Buying a Drum Carder Worth It? To put it clearly: Even with a drum carder carding takes a long of time and is tedious work. Maybe not carding itself, but the teasing, which can take a lot of time if the fleece is less than perfect (badly shorn or lots of vegetable matter). And a drum carder can neither transform a bad fleece into a good one, nor magically take out foreign matter. Even if quite a lot of dirt does fall out during carding, a lot of seeds and bits of hay will remain in the wool and you'll have to pick out the pieces one by one. In my opinion, buying a drum carder only makes sense when you can cheaply get large amounts of raw wool (from your neighbour's sheep, for example). Buying washed locks is not worth it - the price difference between washed locks and ready-to-spin rovings or top is not big enough. 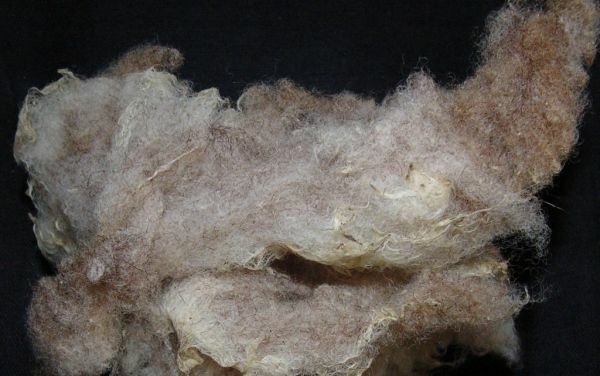 Besides, industrially washed wool is often partly felted - it may be so bad that you can't tease the locks apart with your fingers - you'd need a picker (the next step in industrial processing). 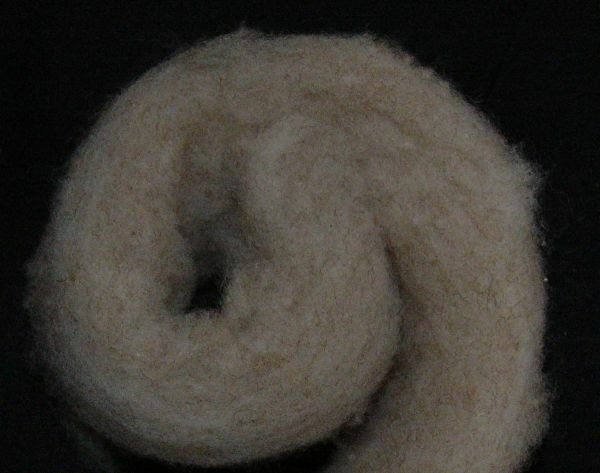 Of course, a drum carder is also great for blending bought rovings or tops - but whether you want to spend that kind of money for that purpose is your decision.